Can the Working Families Party succeed in America? The United States is shifting to the left. What happens next? Credit: http://democracy.com/Upstate Working Families Party. All rights reserved. Are you fed up with having no-one to vote for in elections, or always having to choose between the lesser of two evils? Maybe you’re even skeptical about the value of representative democracy in general now that corporate interests have become so dominant. If so, welcome to the club: there’s no constituency in formal politics for any transformational agenda. Faced by this dilemma, one obvious way forward is to develop new political parties, but (the Syriza coalition apart perhaps in Greece) they have a poor record of sustainability and success. That’s where the experience of America’s Working Families Party (or WFP) may have some useful lessons to offer. Working within the constraints of the American political system like first-past-the-post elections and no proportional representation, and determined not to play the role of spoiler in elections, the WFP has used its ability to cross-endorse candidates to win commitments from legislators on specific issues that range from hikes in the minimum wage to the repeal of New York state’s draconian drug laws to the passage of legislation on paid sick days (especially important since half of all American workers have no paid sick leave at all). In the 2000s the WFP expanded to Connecticut and Oregon, and now it has established a presence in seven additional states. The Party has been closely associated with the rise of Bill de Blasio, whose races for New York city council, public advocate (a citywide elected position), and then mayor were strongly supported by the WFP. It has played an even greater role in electing a progressive majority to the New York city council, which for generations had been dominated by the various Democratic Party machines. Before the Tea Party showed the country what can happen when activists challenge and defeat powerful incumbents in political party primaries, the WFP had done this on numerous occasions at the state and local levels. In 2015 a group of unions and community organizations in Chicago formed something called “United Working Families,” which models itself on the WFP and now works closely with the Party to develop its strategy. United Working Families backed the candidacy of Jesus “Chuy” Garcia against Chicago mayor Rahm Emmanuel, as well as a slate of city council candidates, several of whom defeated Emmanuel-backed incumbents to join the city’s growing Progressive Caucus. The WFP has supported dozens of grassroots activists and leaders to win election to county and state legislatures in several states, including some who have been elected strictly on a Working Families ticket, like Diana Richardson in Brooklyn and Ed Gomes in Bridgeport, Connecticut. Most of these candidates stand on a shared Democratic/Working Families Party or WFP/Independent line. In many cases they would not have won without the Party’s support in the form of electoral strategy and voter outreach. Just as importantly, they wouldn’t have run in the first place. At the most basic level, the Party has demonstrated that it is possible to craft an ‘inside-outside’ strategy that enables forces to the left of the mainstream Democrats to have a party of their own without appearing entirely quixotic. These achievements suggest that the WFP should rank as one of the most successful left-wing political projects in the U.S. in recent decades. But that success has to be qualified for at least three reasons: risk-aversion, membership, and resources, all of which are closely connected. The individuals who founded the WFP came out of that part of the American New Left that went into the labor movement and community organizing, in organizations like Teamsters for a Democratic Union, ACORN, and Citizen Action. They believed that no party purporting to represent working class people could do so without some relationship to labor unions, and indeed the Party would never have gotten off the ground were it not for the investment of progressive unions like the Communications Workers and the Auto Workers. As the Party grew and attracted more notice, other unions affiliated themselves with it, bringing resources, political power, and access to members, but not always the same commitment to the importance of independent politics. The transactionally-oriented political strategy of many American labor unions has always argued for an accommodation with incumbents in power, while labor’s desperation in the face of an unrelenting, decades-long corporate assault militates in favor of prioritizing Democratic majorities at whatever cost. This is partly because the chances of new “right to work” laws are somewhat diminished when Democrats are in power in the state legislature. At the same time, the WFP has found that challenging—and sometimes beating—complacent or corporate Democrats is the surest way to force Democratic office-holders to prioritize the needs of working people over wealthy donors. The tensions between these two strategies (one accommodating and the other confrontational) are often muted, but at times they can explode, as they did when the Party struggled with whether to endorse incumbent New York governor Andrew Cuomo for re-election in 2014, or back a more radical challenger called Zephyr Teachout who was seeking the Party’s support. The politics behind the WFP’s ultimate decision to back Cuomo were complex, but the outcome has led skeptics to argue that the Party is constitutionally incapable of mounting a serious challenge to the political status quo when the stakes are high. As impatience with a broken political system boils over and movements demanding more radical change grow louder and more powerful—on climate, racial justice, and the rights of low-wage workers—the WFP will struggle to demonstrate its relevance to those who are taking to the streets unless it can figure out how to position itself as a more insurgent form of politics. The second challenge is building a base. The WFP was built by organizers, including some who were trying to organize fast-food workers decades before this cause captured the Left’s political imagination. But it has not proven easy to enlist large numbers of people directly in a project of building a political alternative to the two major parties. 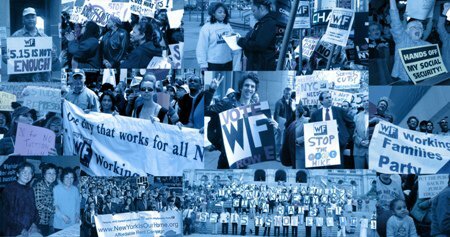 Though the WFP has an activist core, and tens of thousands of people consistently vote for WFP candidates in New York and Connecticut, the number of people who self-identify with the Working Families Party and who pay dues to support its work is very small. This is partly because the Party makes many of its interventions in small races that don’t attract a lot of media attention, and partly because the outsized say of labor unions in the Party’s decision-making leaves limited space for member-activists to influence the WFP’s direction. The absence of a mass base is the source of the Party’s third and biggest challenge: resources. The WFP has pioneered a ‘candidate pipeline’ that recruits, trains, and propels progressive activists to run for office, and helps them succeed once they get there. But this requires dedicated staff, as does knocking on doors every night of the week to talk to voters. Establishing operations in states where they don’t currently exist also demands significant up-front investment. In theory, a political organization committed to building independent political power should be able to rely on the resources of the people it wants to represent, but in this regard the WFP is no different from the mass of progressive organizations in America that have not yet figured out how to persuade regular people to consistently turn over some portion of their earnings in order to build institutions that might have the power to effect real political change. The WFP came about at a moment when American politics as a whole, and the Democratic Party in particular, were shifting to the right. In 2015, despite the Tea Party and a resurgent wave of white rage, the United States is moving to the left (and young people in particular). At least rhetorically, the Democratic Party will move in step with this shift, but their cosmetic attempts will not dispel the pervasive sense that the political system, and the two major parties that make it up, are damaged beyond repair. The American political system makes it exceedingly difficult for new parties to emerge. At the same time, the appetite for such a party on the left is as strong as it has been in generations. The Working Families Party is the most obvious candidate to fill this gap. Events will tell if it is capable of seizing the opportunity.